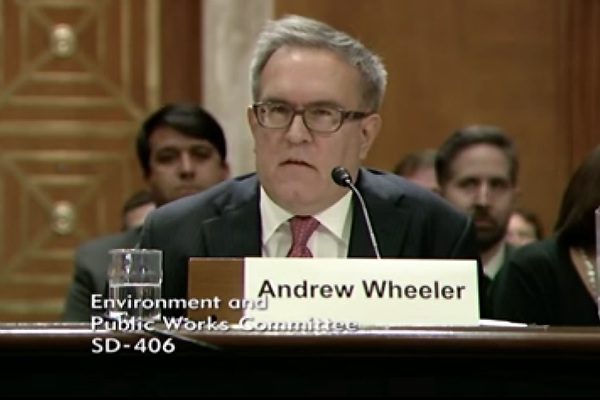 Andrew Wheeler testifying before U.S. Senate Committee. Last week, this program discussed the spending and mismanagement scandals plaguing the U.S. Environmental Protection Agency, and how they are increasing pressure on President Trump to fire EPA Administrator Scott Pruitt. But if Pruitt goes, who is next in line to run EPA? The U.S. Senate recently held hearings to confirm EPA’s new deputy administrator, Andrew Wheeler, who will automatically step up should his boss step down. Senator John Barrosso of Wyoming was among the Republicans who praised Wheeler. But notice that this “broad” base does not include any environmental or public health organizations. Why is this? Well, that’s because after working for EPA, Wheeler became a lobbyist for Murray Energy, an Ohio-based coal mining company. Murray Energy repeatedly sued EPA to overturn pollution control regulations and donated heavily to President Trump’s campaign. During the hearing, Senator Sheldon Whitehouse, a Democrat from Rhode Island, held up a series of giant blown-up photographs. The pictures showed company owner Bob Murray getting a bear hug from Trump Energy Secretary Rick Perry in March of last year, with Murry’s lobbyist, Andrew Wheeler, sitting nearby in a conference room. The photos showed Murray handing Perry a detailed, written action plan for dismantling EPA pollution control regulations. It should be noted that the Department of Energy staff photographer who took the photos and released them to the press, Simon Edelman, was quickly terminated. Maryland Senator Chris Van Hollen said that Andrew Wheeler would not be much of a change politically from EPA Administrator Scott Pruitt, should he replace him. Wheeler and Murray both donated to Pruitt’s political action committee, when Pruitt was Oklahoma Attorney General making a name for himself by suing EPA on behalf of energy companies. “The relationship between Pruitt and Wheeler and Bob Murray gets even cozier when we see that Bob Murray was a co-plaintiff in 8 of the 14 lawsuits that Pruitt brought against the EPA before Pruitt became the administrator,” said Van Hollen. There is a difference, however, between the current and potential leadership of the EPA under Trump. While Scott Pruitt often acts as if he’s lobbying for fossil fuel companies, Wheeler until recently was literally being paid as the lobbyist for a America’s biggest privately owned coal mining company. That’s not just the appearance of a conflict of interest. It’s the embodiment of one.